Waynetta Lawrie (left), of Tulsa, Okla., stands with others at the state Capitol in Oklahoma City in 2007, during a demonstration by several Cherokee Freedmen and their supporters. "The Cherokee Nation can continue to define itself as it sees fit," U.S. District Judge Thomas F. Hogan wrote in his ruling, "but must do so equally and evenhandedly with respect to native Cherokees and the descendants of Cherokee Freedmen." After Emancipation, the Cherokee Nation granted its former slaves tribal citizenship as part of a treaty with the U.S. government in 1866. But in 2007, Cherokee members voted overwhelmingly to strip 2,800 Freedmen of their membership, defining tribal citizenship as "by blood." NPR previously reported that the U.S. government had opposed the tribe's vote and that at one point, the Department of Housing and Urban Development suspended $37 million in funding to the Cherokee Nation. Marilyn Vann, president of the Descendants of Freedmen of the Five Civilized Tribes — one of the plaintiffs in the lawsuit — called the decision "groundbreaking." "There can be racial justice — but it doesn't always come easy," Vann told NPR. "What this means for me, is the Freedmen people will be able to continue our citizenship ... and also that we're able to preserve our history. All we ever wanted was the rights promised us, to continue to be enforced." The tribe's attorney general, Todd Hembree, said in a statement Thursday evening that the Cherokee Nation does not intend to appeal the decision. "The Cherokee Nation respects the rule of law, and yesterday we began accepting and processing citizenship applications from Freedmen descendants," Hembree said. 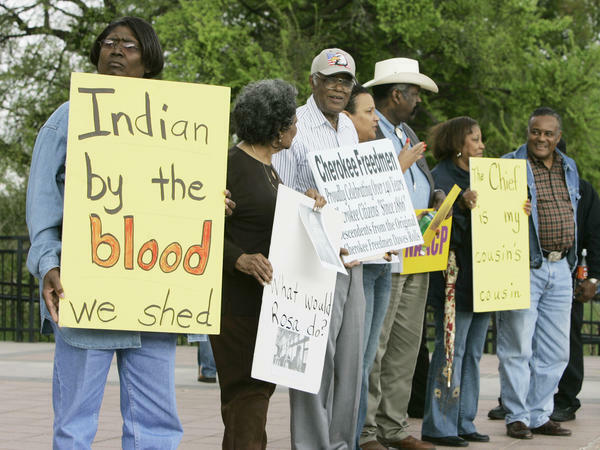 "While the U.S. District Court ruled against the Cherokee Nation, I do not see it as a defeat. As the Attorney General, I see this as an opportunity to resolve the Freedmen citizenship issue and allow the Cherokee Nation to move beyond this dispute."